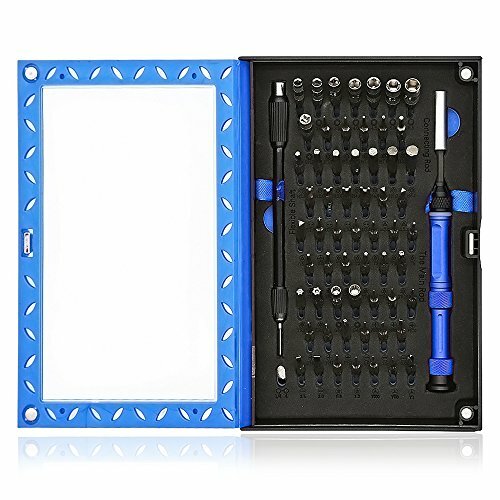 Note: This 63 in 1 multifunctional screwdriver repair tool set are magnetic, well-packed in a small and compact plastic box, portable and easy for storage at home or office. Multi bit Screwdriver Set: This precision repair kit include varies size of Torx,Triwing,Hexagon,pentalobe,flathead,philips,triangle screwdriver bits with nut driver set and game driver bits. Complete and Frequently used size for your Repair: Torx driver bit size: T1 T2 T3 T4 T5,Torx Security size:T6 T7 T8 T9 T10 T15 T20 T25,Triwing screwdriver size:Y000 Y0 Y1,Pentalobe P2 P5,Philips screwdriver size:PH0000 PH000 PH00 PH0 PH1 PH2 & 3.8mm,4.5mm game driver bit for Nintendo console. Widely application: professional repair tool set for Nintendo Wii, Gameboy advance,Apple,Iphone, macbook,computer,laptop,xbox one,xbox360 controller,Thomas toys,PS3,PS4,Eyeglasses,calculator,sockets and many other small electronic devices. Made of CR-V steel, durable for long time use, A must have repair kit for personal collection or gift for friends and family. Flexible shaft help you get wherever is hard to get reach, with 1/4 adapter,it is easy to connect with power tools. Magnetic driver bits help you easy to handle micro screws.Compact and well-organized in plastic box, easy to access and store.